Friday, November 3 marks exactly sixty years since the first flight of a living creature, the dog Laika, into space. Her flight made history but she also became the first earthling to die in orbit - of overheating some five to seven hours after launch. Following the launch of the first artificial satellite of the Earth, the Sputnik, on October 4, 1957, the Soviet leadership decided to consolidate the success that had technological and, on top of that, political significance for the country. Nikita Khrushchev, who occupied the post of First Secretary of the Soviet Communist Party’s Central Committee, ordered a second space launch that was to take place on the eve of the 40th anniversary since the Bolshevik revolution of 1917, which the Soviet Union would mark on November 7, 1957. Sergei Korolyov, the Designer-in-Chief of OKB-1 design bureau [Energiya corporation at present], who supervised research and development of the first launch vehicle and the first Sputnik, objected to Khrushchev’s initiative, saying a replication of the first launch would be senseless. Along with it, completion of all the works necessary for sending into space the so-called Object D - a sophisticated research satellite that eventually was taken into orbit on May 15, 1958, as Sputnik-3 - was impossible, he said. However, the USSR’s top decision-makers issued an official order on October 12, 1957, to launch a second satellite carrying a dog aboard. By that time, the Soviet Union had gained experience in launching animals on geophysical rockets into the stratosphere. The special airproof compartments the animals were placed into assured one or two hours of their living ability. A special laboratory at the Soviet Air Force’s Aviation Medicine Research Institute that prepared animals for flights completed the training of ten dogs by October 1957. The researchers selected stray dogs for high-altitude missions, since they were more enduring than pedigree dogs. 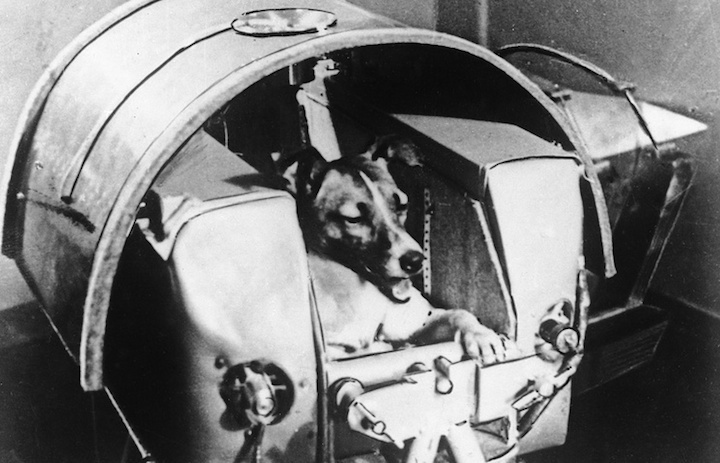 Three dogs were selected as candidates for the flight aboard Sputnik-2. Preference was given to a two-year-old Laika that weighed about 6 kilograms. Dr. Vladimir Yazovsky who stood at the head of medical and biological research with the aid of rockets gave the final approval to her. Albina that had already made two flights was chosen as Laika’s backup. She was pregnant and the researchers took pity on her. The third dog, Mukha, was used for testing the gauging equipment and life support systems. Dr. Yazdovsky gave surgeries to all the three dogs - he implanted gauges for measuring blood pressure into their carotid arteries and into chests for tracing their electrocardiograms and rate of respiration. Laika’s plight was clear from the very beginning - she was doomed to die, since there was no opportunity to return Satellite-2 to the earth. Technologies for return missions of space probes did not exist at the time yet. Development of Sputnik-2 took a fantastically short time, as the stage of initial graphic designing was skipped. Designers took a decision to keep the satellite attached to the final stage of the rocket in orbit and use the carrier vehicle’s telemetric system, since installation of a separate system of data transmission on the satellite would require much more time. The orbital capsule itself had a conical shape, the height of about 4 meters and a foundation of 2 meters in diameter. The dog would be placed into an airproof compartment with a removable lid and an observation hatch. Laika’s spacesuit would be attached by wires to the hull of the compartment and she would be able to take the lying or sitting position. The satellite’s life support system would endure for seven days. On November 3, 1957, a month after the epoch-making launch of the Sputnik-1, the Sputnik launch vehicle lifted off from the testing range of the Defense Ministry that would transform later into the Baikonur Space Center. Laika got into outer space. During the liftoff, her pulse reached 260 beats per minute, a figure exceeding the norm by a factor of three and the rate of respiration increased fourfold to fivefold. However, when the capsule got into the zone of zero gravity, all the bodily indicators returned to normal. Engineering miscalculations became clear soon enough, as the satellite got heated rapidly. While in the first hours of the flight the temperature in the compartment varied from 10 to 38 degrees centigrade, it reached 42 degrees seven hours later. The onboard equipment of the satellite developed a flaw during the first day of the flight and telemetric data started taking some time to reach the ground control mission. The result was that ground control stopped receiving exact information on Laika’s condition soon after launch. Experiments with other dogs on the ground prompted a conclusion that the dog died within five to seven hours of the flight. As for the Sputnik-2, it stayed in orbit through to April 14, 1958, when it burned in the atmosphere. It made 2,370 revolutions around the Earth. Soon after the flight, the cigarettes under the brand name Laika appeared in the tobacconist shops and kiosks across the USSR. The pack showed the dog’s snout. In 2008, a monument to Laika was unveiled on the compound of the Russian Air Force’s Central Research Institute where the dog was prepared for the flight. It has the form of a two-meters-tall rocket heading towards outer space. The rocket transforms into a human palm, standing on which is the legendary dog. Laika the Dog is featured in several animation films.